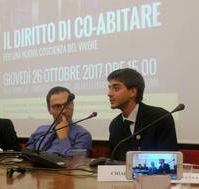 (9 Nov 2017) – ECOLISE representative Riccardo De Amici recently joined Italian MP Mirko Busto, RIVE Rete Italiana Villaggi Ecologici co-president Andrea Stagliano and others for a conference about proposed legislation on the rights of cohousing and ecovillage communities. A docufilm entiled Abitare Sostenibile – Corto made by Prof Isabelle Dumont and her students at Universita degli Studi Roma Tre was screened at the meeting. For a report in Italian please see here.